Wedding favors can be a nice touch for your wedding. It gives you the opportunity to personalize your day as well as a nice thank you to all of your guests. After all, they did take the time to come to your wedding and probably got you a gift or even attended other events leading up to the big day. That said, it can be difficult to find a meaningful and useful favor for your guests to take home and enjoy. I see it week after week, dollar store trinkets with the wedding date stamped on it. Most guests don't even bother to take them and they end up getting tossed out in the trash when we clean up in the morning. Another consideration for a destination wedding is travel. Keep in mind whatever your favor is your guests will have to take it home with them. While a potted plant may be a super cute favor that many guests would have actually enjoyed had they been only a short drive from home, not many will want to carry it through airport security. So I have put together some favor ideas for you that your guests at a destination wedding that will add a cute personal touch to your wedding day but that your guests will actually want. 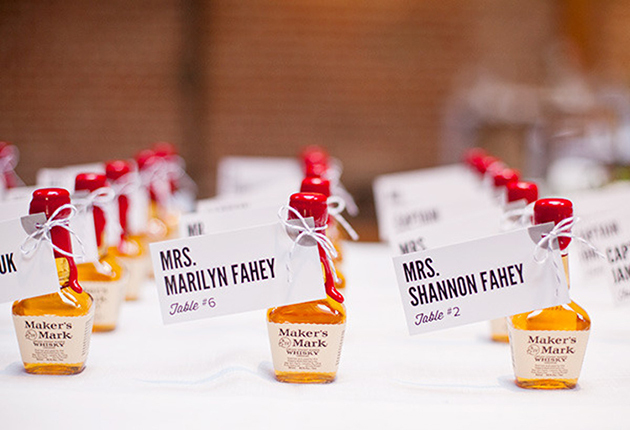 This favor will certainly not go to waste on your wedding day, mini bottles of booze or bubbly! A fun way to thank your guests for their efforts and support and to help get the party started. 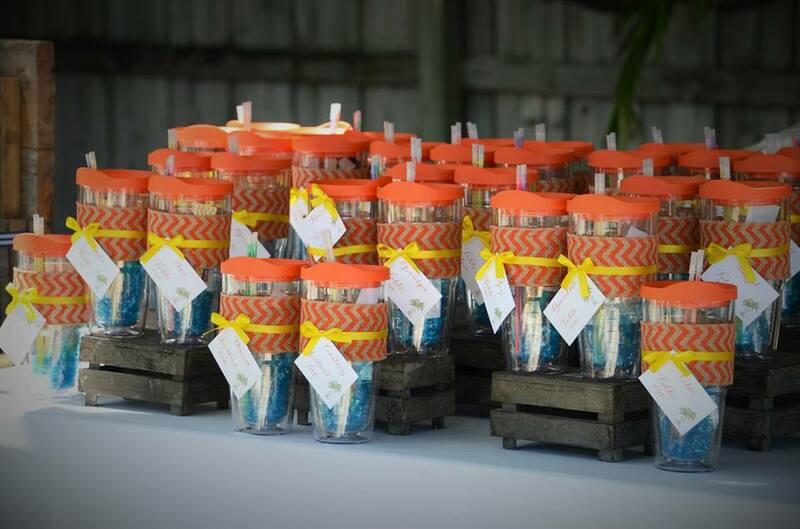 Another great wedding favor that also has a double use at the wedding are custom Tervis tumblers. You can display them as your seating chart and your guests can use them at the bar. They are also perfect for a tropical destination wedding where your ice melts fast it will help your guests stay cool. I know I love my Tervis tumbler for drinks on the go. 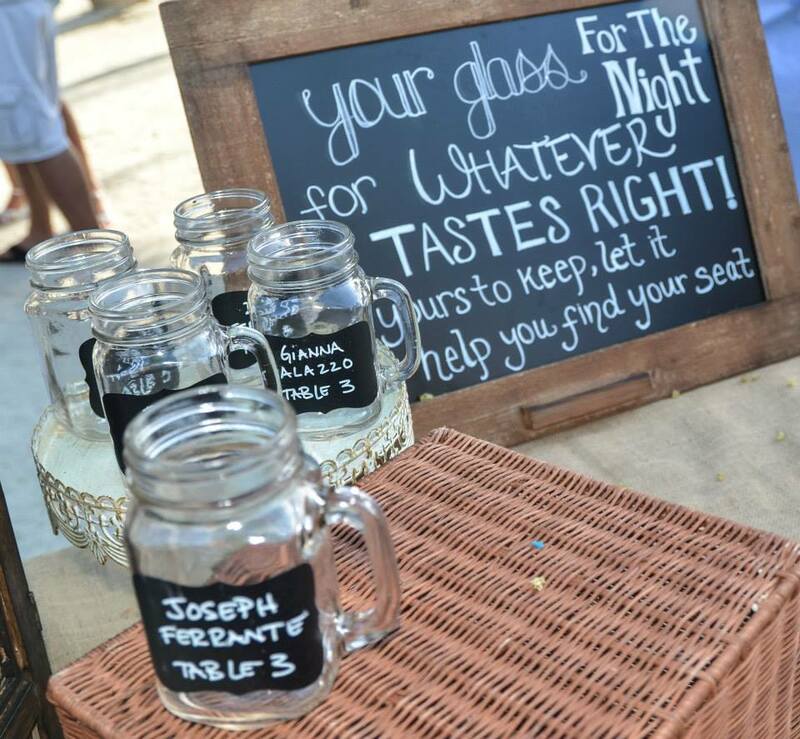 You can also customize colors to match your theme like they did here at this wedding below. Another similar option that is a little more affordable than the tumblers is the same in theory but mason jars instead. Our bride from last weekend was a local artist who used her artwork for her table names and then as favors gave her guests prints of her artwork. Such a great idea and people loved them! (I even snagged one!) If you are not a talented artist like this bride you can still make this idea work. Choose a theme that matches your wedding, ie the Florida Keys and get some small prints for people to choose from allposters.com is a great source or maybe you know a local artist you can work with. All Artwork by Michelle Nicole Lowe, please visit her website for more information on her work here. These were her awesome wedding favors below. For more wedding ideas contact us at Caribbean Catering!